Roath Basin South covers 37 acres of post-industrial waterfront land on Cardiff Bay, report the architects. The design practice won a 2005 Welsh Development Agency invited competition involving a pedestrian / cyclist / road bridge needed to facilitate development of this area. The shortlist also included Grimshaw, Yee Associates and Murray Dunlop Architects. Igloo (Morley Fund) is the developer, with the first building being BBC TV studios where, among others, Dr Who will be filmed. This Energy and Resource Efficient Mini Eco-City covers 59.61 hectares. 270 houses, some 1800 apartments, all supporting facilities and a marina are laid out in accordance with a site specific Urban and Environmental Code, with Central Park as its backbone. An already reclaimed patch of land on the Lagoon is expanded in the direction of the prevailing winds, in the process creating elongated shorelines. It puts to use the most significant natural asset of Lagos – the Lagoon. 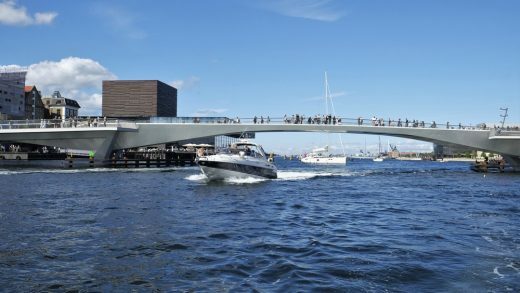 An innovative sliding bridge – a new landmark structure gracing the Copenhagen harbour. Current projects by this design studio include innovative social housing in London and Paris, a new E6m bridge in Paris, just won in a limited competition, London Cross River Tram Spaces and Places, individual houses in the UK and Africa, a bridge in Swansea, and working with unplanned communities in Kenya. Planning permission secured involving the Gropius House in Chelsea. Bridges completed by the architects include Kent Messenger Millenium Bridge, Maidstone, UK.